Finally April is over, and summer is near. Well actually is closer than that because it's been soooo hot these past few days, which makes me feel that summer is already here. I just can't wait to wear my sandals!! Mac Studio Finish Concealer in NW25. I never thought that I would even like this concealer, because most of the reviews I've read were negative, mostly about how thick and drying is. I've tried lots of Mac concealers in the past but I never liked any of those. But Studio Finish is amazingly good, I don't find it thick or drying and I have dry eye area, it covers very well but it would do a better job if I had bought the right shade, because NW25 is a little dark for me, next time I'll go for the NW20. Estee Lauder Bronze Goddess Soft Matte Bronzer, ohhh well that is a pretty long name for a bronzer! This is my go to bronzer for almost 3 years now and I haven't even hit pan on it, it's a pretty huge packaging it contains 21g of product, way more product than other bronzers in the market. Perfect shade for any NC20 or NC25 skintones like me, and it's completely matte. Sephora I.T. 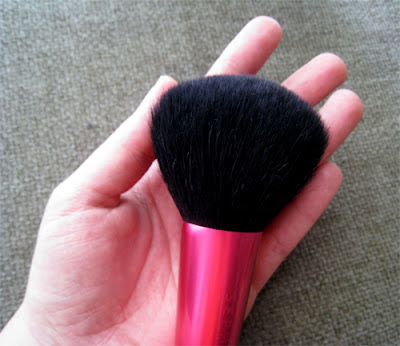 Round Powder Brush. This is the brush I use for my bronzers, and as you can see from the picture I took to compare it with my palm, is humongous!!! Some people prefer smaller brushes for bronzer because they do a better job for contouring, but I prefer to apply my bronzer all over my cheeks and forehead with a fluffy brush for a more natural sunkissed look, and this brush does a really good job for that. 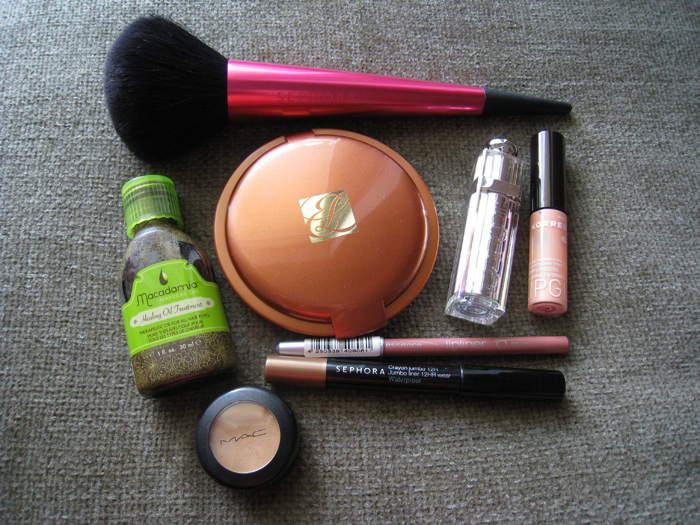 It doesn't apply too mush bronzer nor too little, just the perfect amount, and I love how soft and fluffy is. I have it for a year now and it's still as soft as it was the first time bought it. Sephora Jumbo Liner 12HR wear in 06 Copper. I have 3 more of these Jumbo eyeshadow pencils but this shade is my favorite! I believe it's a dupe of Urban Decay's 24/7 Glide On Shadow pencils but these are not available in Greece and also I would never pay that much money for them, Sephora's version is cheaper and with amazing quality and also very long lasting and blendable. Make Up Forever also released similar ones this spring, the Aqua Shadow pencils, but they're also very expensive like UD's. Korres Cherry Lipgloss in 11 Light Pink. The perfect everyday lipgloss, with no shimmers, that you can layer it over any color of lipstick. It's shows up almost clear on the lips with a hint of milky pink. The Cherry lipglosses are extremely hydrating, and never show up any dryness on the lips, it must be the cherry oil it contains. Dior Addict Lipstick in 343 Miss Dior. I remember last summer it was my go to lipstick, it has a balmy texture, and you can't tell if it's a lipstick or a tinted lipbalm, you can even apply it without mirror on the go. Miss Dior is a light peachy shade with beige undertones and fine silver shimmers. I want to try more of the Dior Addicts in the future. Essence Lipliner in 01 Soft Rose. The lipliner that goes well with almost all of my lipsticks. A light pink with some beige undertones, very soft and smooth, and also very very cheap. I'll keep repurchasing it in the future for sure! And something for my haircare, is the Macadamia Healing Oil Treatment. I blow dry my hair everytime I wash them so I always need something that will protect my hair from the heat and the split ends. I always use the John Frieda Extra Strength Serum but last year I purchase this Macadamia oil in the small bottle just for a change, and I seriously loved how smooth it made my hair, and it's also not a heavy oil, it didn't weight down my hair at all and I have oily hair. For some I reason I returned back to the John Frieda in the winter but now I rediscovered the Macadamia oil and I'll try to use this from now on. I also want to try more oils in the future to compare. Thank you! Yes it's really good, I want to try more oils too, I think they're perfect for summertime also. Poly oraio to post sou !!!!! Ola sou ta agapimena apoteloun k dika mou :) !! Nai to powder brush einai polu kalo! Kai den to perimena, alla polu kalutero apo Mac face brushes. :-) Polu kala glosses pragmati! Πολύ μου άρεσαν τα αγαπημένα σου! Θα τσεκάρω το bronzer της Estee Lauder, όπως και το πινέλο! Το μέγεθός του φαίνεται ιδανικό!! Το concealer της Mac είναι και δικό μου αγαπημένο, αν και το χρησιμοποιώ για το πρόσωπο! Στα μάτια δεν το έχω δοκιμάσει ποτέ! To bronzer einai para polu kalo, na to dokimaseis sigoura!! Το lip gloss του Korres έχει πολύ γλυκό χρωματάκι..
Αυτές τις ημέρες τρέχει ο πρώτος μου διαγωνισμός..
Τέλεια τα κραγιόν!! Και το πινέλο. Για το macademia έχω ακούσει τόσα αλλά δεν τον έχω δοκιμάσει ακόμη..
για το κονσίλερ, μιας και έχω το NW20 & Nw25 δεν λεω κάλυψη άψογη αλλά στα μάτια εμένα σε 1 ώρα χαλάει ότι κι αν κάνω, οπότε μόλις τελειώσει θα πάω για άλλο προϊόν.. ευτυχώς εσένα σε βόλεψε! Είναι μεγάλο θέμα το κονσίλερ! Nai to xerw, exw dokimasei para polla concealers, to na vrw ena kalo einai toso duskolo oso na vrw kali mascara! !